ever get your bearings turned around? This is all very interesting though, you've put a lot of effort and study into this Hugh.. The Mirror world, Mirror experiment, and spacial perception ideas are interesting to say the least.. Thanks Professor T! Yup, these are interesting things to think about... I've started other threads in other forums about Visual Reorientation Illusions... if you google it you'll find them if you're interested. You probably didn't experience a correction because you had become too familiar with the viewpoint as it was, even though "actual North" was where your "perceived South" was. Rarely, I'll find myself a little lost when leaving shops, buildings, picture theaters.. My orientation is usually a pretty well honed faculty, and I'm the sort of person who makes a mental map of an area, and always leaves unfamiliar places the same way I entered to ensure I don't end up lost.. And if I do find myself disorientated I don't feel or perceive any correction or reorientation, maybe because that faculty is drowned out by relief that I now know where I am.. It would be interesting if you attempted to become hyper-aware of your orientational bearings at times like that, to see if there is an actual reorientation "back to the normal viewpoint" that does occur. The VRI flip can be very subtle if you are not aware of its existence, or actively seeking out its occurrence. That's fascinating! It's possible that as a child you experienced that area in a 180 degree turned around viewpoint at times, but as you got older, your brain got used to the orientation that you now normally see it in and it stuck. It is an interesting fact that our memories are linked to the orientational viewpoint that we see any particular environment in. I've discussed this with other people who are familiar with VRIs and they all agree. As you saw that turned around environment, it brought back some memories of when you were actually there. The idea that higher dimensions exist and VRI's and alternative perceptions exists indicates this is a reality IMO.. And like you eloquently put it, the fact that all these extra viewpoints are available is the most interesting thing about this phenomenon. Perceptions can shift and change, placing laws on what you can and cant perceive is like writing laws for the illiterate to read. Am going to give the Mirror experiment a go sometime soon. That's great! I'd like to hear if you can achieve the flip by conscious thought! Try it in a movie theatre too... It's so cool to turn the theatre around to each of the four orientations at will! I tried the Mirror test.. Sorry, It didn't seem to work, Maybe I was doing it wrong.. dunno.. Anyway, it got me thinking about creating a set of ocular inverting glasses.. Using mirrors on a headset-type setup to basically give the same illusion by essentially tricking the brain into thinking the stereoscopic vision has been swapped.. Kind of like popping out your eyes and swapping them around, but without all that mess, lol.. I was thinking about a simple setup, like the old telescopic pieces that allow people to look around corners, except having two that cross over so that the left eye becomes the right.. I got goggling... Then I found this.. If I'm not mistaken, the Reversing goggles might allow you to experience a 180 degree vertical or 90 degree horizontal VRI..
From what I could understand about both of those devices, neither would produce a VRI, but they would produce some interesting visual effects. The upside down goggles would show you what is in front of you upside down, but with a true 180 degree vertical VRI, you would be turned upside down along with the image, relative to your original position. For example, a 180 degree vertical VRI in space would start off with you perceiving you are floating upright in an upright spaceship "under the Earth", then in an instant, you would find yourself floating upside down in an upside down spaceship "over the Earth". This happens to astronauts all the time, and it can be triggered by seeing someone floating by them "upside down" and then all of a sudden they perceive that it is they themselves that is "upside down", and they do a conscious VRI to flip things "back to normal". The same type of perceived visual turn around happens here on Earth with a VRI, except the axis that the spin takes place is along the vertical, rather than a horizontal one. You think you are facing your normal West, then you realize that it is actually East, then the whole world takes an instant perceived spin around to flip things "back to normal". Picture yourself sitting in the room you are in, facing your computer, in a big glass house, and note the direction you are facing, let's say it's North. Then a big hand comes down from the sky, gently picks up your whole house, turns it 180 degrees around and puts it back down. You now know that you are facing in the opposite direction that you were before, you and your house have been turned around 180 degrees. You are still looking at your computer and your room and house in the same relative direction to them, but overall, you are looking towards the South at everything now. Well, the VRI is the exact same, except that the whole universe is turned around, not just you and your house. You sense that you are facing in the opposite direction that you were facing before the flip, that's for a 180 degree VRI, for a 90 degree VRI it's just like your universe has been turned 90 degrees to the right or left from where it started off. I'm curious... when you tried the mirror test, did you see the 180 degree turned around room on the "other side" of the mirror's intersection? Also, did you see this updated picture of the mirror VRI flip? Yeah, I've tried the Mirror flip several times with no result (perhaps my mirrors aren't big enough.) And have seen the updated picture.. I think this is probably a really cool thing to experience, alas, I don't seem to be capable, (possibly due to mirror size). I do see the room reversed, and me, but no VRI flip. What interests me though is the Quote above..
What you have written here does sound like a form of Projecting.. And I wonder now if you are not astral Projecting, but kind of Spacial Projecting.. Becoming another object, even if it's just a reflection of you, is projecting your consciousness outside of your body, or in the very least it is projecting your conscious orientation outside of your body..
And if so, I wonder, when you are driving, or playing a game on a PC, do you not find it easy or could find it easy to "become" an extension of the Car you are Driving or "become" an extension of the character in the game? (silly question I know, but "becoming" & "Projecting" seems to me to be integral to this. Thanks for trying Professor T! It's true that using larger mirrors makes this easier. Perhaps you can try the experiment again once you are more familiar with achieving the VRI with another method which I'll explain in a bit. Interesting question... It's a really fascinating thing to explore. I feel that whether I am in either position, I am still the same "me", all that has changed is that I'm now looking at everything from a different direction. Each position is equally valid. I am not "outside" of my body but more like in the same body but turned around in a parallel dimension or something. I really wish I could explain it more precisely. On a side note, one thing that I've found everyone who experiences this has said is that each memory that they have also has the orientation that everything was in at the time linked to it. For example, let's say you can do a 180 double mirror-induced flip. Before the flip, you think of how it feels to eat an orange, then you do the flip to the 180 degree turned around position, and you think of eating a juicy red apple. Then you let your brain flip everything back to how you normally experience that space. When you recall each memory, you can only do so by including the orientation you were in at the time, so although you can imagine eating that juicy apple in your current position, you can only recall the memory of it in the 180 degree turned around position. People I've talked to have been able to recall certain childhood memories just by remembering their childhood homes and schools in different orientations. I understand what you're suggesting but the VRI rotation is different than this. It is simply a rotation of everything to a new direction. If you were standing there, and I asked you to turn around 180 degrees to the opposite direction and you did, would you be projecting yourself into the new position? You'd likely feel no, you're still the same you, you're just facing a different direction. Similarly with the VRI, except the whole universe, including yourself, gets turned around to another direction. Professor T., I'd be very interested to see if you can do the Movie Theatre VRI. It's the easiest place for me to do the VRI, to each of the four different possible orientations. The 180 is the easiest for me, and for almost everyone I've ever talked to about this so you might want to start with that one, as indicated in the picture I made up. In preparation before going to the theatre, try to imagine yourself being in different theatres you've already been in during your life. With each memory, think of the direction that you faced each screen, relative to where you are right now. Think of each movie that you can remember, and physically turn your body right now to face the screen in the same direction that you saw each movie in. Hopefully, you can recall at least one movie facing each of the four perceived cardinal directions. Try to arrive at the theatre early, and practice flipping it around to each of the four previously recalled orientations, starting with the 180 turned around one. Keep on trying every now and again during the movie, just think that you're watching another movie you've seen in one of the other direction facing theatres. The VRI flip should happen at some time, even if only for an instant! Just discovered this forum and your VRI thread, and I am very impressed by the hard work you have put in to explain this phenomenon. We had interacted a few years back on this topic of 'flipping in four cardinal directions' on another 4D forum. As we have discussed earlier, this is a daily reality for me which I have been experiencing since childhood. It was very disorienting as a child, I would often feel lost at odd places, unable to come back to the normal frame of reference. There were instances when I flipped in the middle of exams, and had difficulty restoring continuity of thought - very frustrating. I had no idea what was happening, and no words to describe it to anyone. By the time I reached high school, I knew that it was possible to change the visual orientation by shaking myself, and I would do so to maintain a recognizable, normal frame of reference during important conversations and tests etc. Involuntarily getting stuck in some perceptual island can be very inconvenient if your goal is to function like a normal 3D human being. Sometime during college years I started observing this involuntary flipping carefully, and noticed that it could be put to use if made voluntary; shifting to a less visited 3D view, I would be able to study with acute attention and retain a lot more - almost with photographic memory. It appeared as if it was an uncluttered part of the memory and had high absorption potential - the quality of attention would be uncanny, often surprising my friends and family. I was not quite successful in building a mental model of the phenomenon at that time. I just knew that there are a couple of pristine states of mind that are not overloaded and are available when needed, and I developed a protocol of accessing those states from time to time. Instead of randomly allowing the 3D views to flip, I would hold a particular view with attention. Now I was less tormented by the involuntary flipping and saw it as an asset, though I did not have complete control over those perceptual states. Nevertheless, it was intriguing and I would observe myself carefully over the next several years. A new 'flipped view' would appear when turning a corner or in the theater or even watching TV - it was something that I became used to, in fact looked forward to, since it provided a fresh 'perspective'. moving from one 3D view to another 3D view was refreshing as if it cleared the burden of the moment (and the memory). I obsessively experimented 'flipping' and concluded that there were precisely 4 distinct 3D views, and that too in 4 cardinal directions - 90 degrees apart, and that they could be bunched in 2 such pairs. I would sit through music recitals in theaters with the main goal of doing this dimensional shape-shifting/flipping experiments. With practice, I could mentally label the 4 directions/orientations, because apart from the change in perceptual orientation, there were other sensations such as distinct memory associated with each 3D orientation. Frequent flipping the 3D views has another benefit of removing mental fatigue - as if the memory is flushed, and the mind becomes sparkling fresh - heightening the enjoyment of the music recital - in fact a completely new, highly alert, yet relaxed quality emerges (without the need for any substance). I had internally concluded that this was my personal evidence for the existence of the fourth spatial dimension. Informed by a fair amount of empirical experience, I searched for textual evidence - I found Hinton, and then Abbott's 'Flatland' and finally Rudy Rucker, who acknowledged experiencing the 4D briefly. Yet, I had never met anyone personally who could relate to it. Over a long period of time, this dimensional flipping became established in my life - as a reset mechanism, and for accessing other internal cognitive resources. Conscious, and voluntary flipping is not a burden but the most generous gift from nature I have received. It is so real that I knew that others must have experienced it, yet had never met anyone who had articulated it clearly, until I came across your posts on various 4D forums, perhaps 8 years back. Now I see that numerous other participants in this forum have acknowledged similar experience. Quite likely it is a universal human ability, though experienced only in brief fleeting moments by most. In your re-use of the (NASA) term VRI (Virtual Reorientation Illusion), the word "Illusion" can be misleading - perhaps indicating that it is a pathological condition. As I have stated above, I see it as an additional subtle ability that can have transformative impact on mental capacity-building. I commend your efforts in introducing this topic so lucidly to wider audiences. Hi SLunatic, it is so great to hear from you again! Thank you for your kind words and for sharing your experiences here! I too feel that the term "illusion" is misleading, as for those that experience this, it is "reality". There are four different viewpoints that can be viewed, and each is as real as the others, with their own unique feelings and memories. Over the years it has been great to hear of others who experience this. This phenomenon has been discussed by those studying Developmental Topographical Disorientation (DTD) as well, although I find that term misleading too. For those of us that experience the flip, and especially those that can consciously make it happen at will, it is not a "disorientation", it is an "awareness" of several specific, unique, orientational viewpoints that are available of the same space. It is interesting to read the comments from others about the phenomenon there, after hearing the episode and realizing there are others who experience this too. There are also several others on that forum who experience VRIs. It's great that the word is getting out there about this, and that we're finding each other and learning more about it along the way. I am very impressed by the amount of effort you have made in increasing your ability with controlling it, and exploring the experience and all of its nuances. I agree, it truly is a gift to enjoy. I followed the links you have sent. I don't agree either with the VRI label or the DTD - both present it like a pathological condition. My experience says something completely different. It is a special ability - a subtle one, where you can perceive more than is generally possible. I think all humans have this condition; most are too distracted to pay attention. Just as a trained musician can hear subtle quarter-tones, while normal humans cannot - similarly, here in this case the ability to detect subtle changes in perception can be further developed. I agree that it is an ability that can be developed, and that most people experience it but aren't fully aware of it happening. Over the last few years I have patiently worked with my wife and daughter to become more aware of their orientational bearings, and they too realize that they experience this phenomenon as well. My daughter will walk into a local mall from a different-than-normal-direction, stop, look at the stores inside, see them in a non-normal orientation, then she'll laugh as her brain flips everything back to the normal viewpoint, and she'll laugh and say "everything just flipped!" My wife experiences similar flips at certain times in certain areas as we travel around. Both have been successful in cognitively initiating the flip in a movie theatre, both 180s and 90s. "Actually, it is possible to have a VRI right here on Earth, as when you leave an underground subway station labyrinth, and upon seeing a familiar visual landmark, realize that e.g. you are facing east, not west. On Earth, gravity constrains our body orientation, and provides an omnipresent "down" cue, so we normally only experience VRIs about a vertical axis." I knew this was exactly what I experienced. It has been pointed out that since then, the term VRI is more commonly used to refer to a perceived Ceiling/Floor visual reorientation in space, and the term used more for the earthly reorientations is "directional vertigo". For me, the term "vertigo" isn't correct because there isn't a feeling of motion or spinning involved. It is an instantaneous turn to a new direction. It's like the Necker Cube flip from one viewpoint to another, it happens instantly. I tend to make mental maps with only 90 degree angles or straight lines. It is hard for me to fully visualize an 80 degree turn for example. My mind will make it a 90 degree turn. It will also mentally map a slightly or even moderately curved road as a straight road as well. What happens is that as I travel around a town that has several curves and odd-angled turns, I will map them all as either 90s or straight lines, and my orientational bearings will be adjusted according to that. But as I return to previously travelled areas, I may end up seeing them in an orientation that is 90 or 180 degrees different from how I originally had seen them. Then my brain flips them "back to normal" with a 90 or 180 degree flip, so that I feel that I know where I am again. It would be interesting to tour the Pentagon, and to think that after perceiving that I've gone all the way around the building after 3 turns that my brain had turned into 90 degrees, that there would still be one more turn needed to get back to the start... I'm sure there are some interesting stories from people who got "turned around" in there. All that having been said, here's my main fascination with this... That I can, just by thinking, see the world around me from different directions at will. To me, that means there are more dimensions to the space around me than I may think, if I only stay in one of the viewpoints and never leave it. Commendable that you got your wife and daughter to work with you on this tricky mission. My wife also experiences it but I have not insisted on her doing any of these experiments. So the evidence is in favor of a universal phenomenon, that everyone experiences it - they are just too busy or distracted to pay any attention. In fact ,there lies the key - that they see the instantaneous 'flipping' as confusion and distraction, since it can appear like a mental disorder and a threat to one's survival. The neuroscientists studying this have played along with that pathological notion, so it is treated as that. Consciously experimenting with flipping is daunting and very tedious, so is ignored. There are rare folks like Hinton, Abbott, and Hugh who take it seriously and work through it for years, because that is what it takes. I first noticed it in first grade and got really scared, but I didn't know how to talk about it, though I have clear remembrance of that incident. My main experiments with the 'flip' occurred nearly 30 years back, when I knew that this was not pathological, but a breakthrough in perceptual abilities. Thus, I went after it with a vengeance - for months together I focused on it and developed insights about the 90/180 flips, pairing and concluded that this was firm evidence of the existence of the 4D. I saw that each of the four 3D views is like a labyrinth; I would work through unlocking the labyrinths in all four views and a major set of breakthroughs started occurring. The pathways associated with each 3D view appeared to be clogged or tangled up in the beginning - the real work was in pushing through the roadblocks in each of the pathways and in untangling the labyrinths from each other. An untangled world meant that, I could consciously move in any of the 3D worlds smoothly without involuntarily flipping. The entanglement was related to emotions and deep memory, as if there was psychic (karmic) residue of the past which had to be straightened out, entangled; I was a young bachelor scientist and life permitted intense focus on such an esoteric pursuit. Regardless of whether there was a karmic angle to it or not, my life took off thereafter - tremendous freedom, confidence and clarity. I built a theory out of it at that time that people are generally confused and dissipated because they don't pay enough attention to what is in front of their eyes. The higher dimensions are facing them in their eyes, and they are choosing to ignore the clues. After searching the scientific and spiritual mall for clues and guidance, I concluded that even if I am the only one experiencing it, it is real and I don't need any validation. It is likely I thought that the limitation was in my articulation, maybe it is a well-known phenomenon. As I carried on with life, this 4D flipping started gathering further new insights leading to new experiments, such as many in the theater, some of which are identical to your theater experiments. Once flipping consciously at will between any of the 4 orientations became possible, I started noticing the transitions, because the question was, who is it that experiences the 'flip'. Perceptually it is only a 3D space but someone is noticing that these 3D spaces are different - who is it, and how does it know the subtle distinction between these spaces? Thus, the focus on the transitions became necessary to notice the observer of the flip. The conscious flipping and observation of the observer led to a completely new set of phenomena: 1) The observer appeared to have a different location than the usual, 2) The four 3D spaces did seem to be emerging from another visible source, and finally, 3) Was it likely that there are other higher dimensions, even beyond the fourth? Over the past 30 years, I have had plenty of opportunity to explore these questions as a scientist, as a voyager. I have never made any public claims, but the richness of this life and this rare phenomenon has been overwhelming. I continue to see myself as the first-grader staring humbly at a complex universe, and also as a graduate student on the verge of a breakthrough in perception and on one's true identity. There are limits to what one can write, but none for what one can experience! It is fascinating to hear of your journey of discovery with this phenomenon. Although I have some control over cognitively initiating the flip, I believe you have taken that ability to a higher level than I, and I commend you for that! I have a deep desire to somehow prove that this is possibly related to the existence of higher dimensional space. Have you done any work on any mathematical or physics ideas that could possibly help out this discussion? 1) Apparatus: All of this inference is taking place with evidence from an apparatus that essentially processes 2D images. Some of us who seem to be claiming to be experiencing the 4D, likely have access to some additional visual facility. What is it? 2) Observer: Who is observing the 'flipping' and recognizing the distinctiveness of the 4D viewpoints? 3) Transitions: Important clues could possibly lie in the transition between the viewpoints. The flipping is being initiated/observed - the transitions may hold the answer to that agency. 4) Higher D: If we are being unreasonable in claiming the existence of 4D, why to limit that notion to 4D? Why not higher? 5) Godel: Explaining the 'flipping' experience in terms of a symbolic system, which has been created by people with constrained visual apparatus, inherently limits the conclusions that can be drawn about a higher-dimensional perception. This is a loose application of Godel's incompleteness, yet has relevance in the efforts of formulating a deterministic explanation for this phenomenon. 6) Not a Disorder: I emphatically refuse to use the terms VRI and DTD for characterizing this '4D flipping' experience. It is not a disorder, it is not a disease. Just because dyslexia exists for some people, it does not mean that there is something wrong with the alphabets. In fact, the numerous people experiencing spatial reorientation/disorientation due to dimensional flipping should be seen as pioneers who are breaking through the perceptual barriers. As I have stated earlier, formal and informal articulation has limited bandwidth. Lets speak sometime in person, and take our dimensional exploration further. Although I'd like to discuss and share ideas in person about this, I'd also like to do so on a forum, where others, with many varied talents and viewpoints can step in and help us out in our journey as well. We're both keenly aware of how the experience feels and appears in our mind, but what I'd like to do is take it one step further... from the subjective to a possible objective reality, which would help to explain why it happens. 2) It's a subjective experience, the individual experiences the flip in their mind's eye on their own. It would be great to share the experience at the same time for others though. 3) What do you experience during the transition? For me, it is only an extremely short period of about a tenth of a second while the reorientation occurs, but the flip in orientation happens instantly, there is no "in between" of facing directions. It's either this way or that in an instant. 4) It could very well be higher than 4D, but if we can't show it's at least 4D, then there's no point in attempting to go higher. String theory involves 10 or more dimensions... I hope that higher dimensional existence can be proven at some point in the future, maybe through the Large Hadron Collider or something larger. I like to think it's possible that the "missing mass" or dark matter of the universe is to be found in the higher dimensions... Anything that can prove the existence of higher dimensions will then beg the question "what is our experience of them" and that's where I hope that VRIs may eventually be recognized for that. 5) I'm not sure exactly what you mean by this... could you explain further? 6) Although I agree it may be an ability, I am open to the possibility that it may be a disorder. I'm not 100% sure either way, I'm still studying it. In the meantime, the closest thing I've come to the discussion of it in science literature is the Visual Reorientation Illusion (VRI). It is Visual, as it happens in the mind's eye, and one sees everything flipped around from where it was. It is a Reorientation, as one's bearings get reoriented in a new direction. The tricky part is the Illusion. "The term Illusion refers to a specific form of sensory distortion." A sensory distortion takes place when my brain maps a 80 degree corner of a road as a 90 degree corner. I accept that there is a distortion, and that's why I accept the term VRI. That having been said, how can I flip between different orthogonal viewpoints within supposed 3D space if there isn't the higher dimensions to enable it? A quote from Aale de Winkel back in 2003 has made me think a lot about this when he said: "I doubt very much that tetra-vision would be the same as x-ray-vision. Tetronians will not be able to see within a trionian body, they see the lightrays reflecting off a body just in a direction more then we trionians do!" For me, VRIs fit the bill for these other directions perfectly. I hope that we can continue our conversations here my friend. We should have this as a record of our journey with this together, as we work on it together and with others to find out more about it! My daughter and I made a video to explain the VRI experience. Enjoy! Just completed a second video explaining the VRI Flip, this time in the setting of downtown Toronto. All comments and ideas for improvement are welcome! Made a new video today about the VRI and how it is experienced in a movie theater. A movie theater is the easiest place for me to cognitively do a VRI, and if you're interested in attempting one, this is the place to try it out. All comments and thoughts are welcome. Enjoy! Hey! I recently got interested in 4d space from a friend. I thought it was so awesome! Since I was 2 seconds old til now, for years and years, the entire world has been in 6 directions. Up, Down, Left, Right, Back and Forth. When I found that there was another it fascinated me so much! I made it my quest to educate myself more about 4d space. I think I have been pretty sucessful, as I understand how the tesseract is rotating not morphing, the smaller "cube" is just farther away on the W axis, a tesseract net is made of 8 folded cubes, similar to 6 squares making a cube. I also have got the "plane rotation" thing, and after this I was actually able to draw 4 perpendicular lines (4 axis pointing in entirely different directions) but the problem is I still cannot visualize 4d space. I have come very close, and followed the 4d rotations, but still I cannot visually grasp 4d space. I cannot imagine what it would feel like to MOVE like that. I recently came up with a theory (I am sure it is already accepted by some ) that there is no distinct "4th dimension" but if you look at the surface of your screen (Forget microscopic roughness and depth) it is generally 2d, therefore it is a 2d object. The SURFACE of things can be 2d, so in a sense we live amongst 2d objects. Find any point in space in the room you are in right now. Find another. The distance in between those is 1d, so we live amongst 1d objects. Who says that there are 1st, 2nd, 3rd, 4th, etc. Dimensions but yet 1 2 3 & 4d objects coexisting in space. What if that chair you are sitting at has more space to it; more dimensions. Our 5 senses (and some spiritual stuff don't get me started on the OBE stuff I am talking science) can only process 3 dimensions that we are "present" in while your arm may actually exist in 4d space . 4d creatures (with how the 4th dimension works) can see all the way around and inside a 3d object just as we can se all the way around (all the sides) and inside (The inside) of a square and so on. I have heard many people say that we see the world in 3d. (Cough bs cough) no offense, but you are wrong . We see in 2 dimensions. You sit on the perspective Z axis and there is space on the XY plane in front of you. that is your FOV. People say we see 3d but I think you are simply thinking of depth perception. I found out about VRIs super recently. The thought of viewing things from ANOTHER direction blew my mind. I immidiately compared this to a higher dimension, which I understand it is only 3d. I think that learning to see the same objects from different angles would be an excellent way to help me visualize 4d better. If you do not pay attention to which way is NSEW does this even matter? Is there any real difference? I heard people say that you see the light hit at a different angle, or it is like you are spinning. What is it exactly like, or does it just a sense of Oh it feels like north is this way. Other people say it is like a whole parallel universe. How? What do you mean by it is all flipped? I am so confused. Also this is the only 2014 VRI Thread I found so Hugh please answer me you are the only person I have know who is easily able to flip consciously anywhere at any time. Hi Cyber, welcome to the forum! VRIs make you feel like you are in a parallel universe, where everything is turned around 90 or 180 degrees from how you normally see things. You can watch the videos in the link in my signature to hear me talk about them and explain them. A movie theater is the easiest place for me to do a VRI. What helps the most is to have a pre-existing mental image of your surroundings in the position you want to go to. Once you have experienced the flip, and seen things in a room from different directions before, it is easier to re-visit that viewpoint. That's one of the reasons that I think that doing the VRI in a movie theater for the first time is the easiest place to try, because we already have a pre-conceived mental map image of "a theater" in each of the four directions - facing north, south, east and west. Having a big flat screen far away as a common element to focus on helps a lot. Think of the times in your life when you have seen a movie at the theater, in each of the four different directions, and get an orientational sense of each of the positions. Picture yourself sitting facing north, then south, then east and then west in each of those theaters. Now visit a movie theater, arriving well before it starts, and think of which direction that you are currently facing. See it in your mind's mental map. Now think of being in the opposite facing theater, for myself, and everyone I've ever talked to about this, the 180 degree flip is the easiest one to achieve. Just let the flip happen. It may take a while. Think about other things, other times you've seen other movies, in other places, which direction that you were facing in those other theaters. If the movie starts and you still haven't experienced the flip, during the movie, every few minutes, just take a second to imagine yourself in one of those other facing theaters, then watch the movie again. The flip should happen at some point if you focus on it enough. You'll think, hey, wasn't I facing the other way when I came in here? The more that you become aware of the VRI, the easier it is to do it. I also believe that it is possible that VRIs are experienced because of the existence of higher dimensional space. Just as, in 3D space, one can view a 1D line from any perpendicular direction and it looks exactly the same, so can, in 4D space, one can view a 2D plane from any perpendicular direction and it looks exactly the same too. With conscious VRIs, one can view the same 2D plane of vision from "all the way around". Once you see them for yourself, you will understand how this is possible. 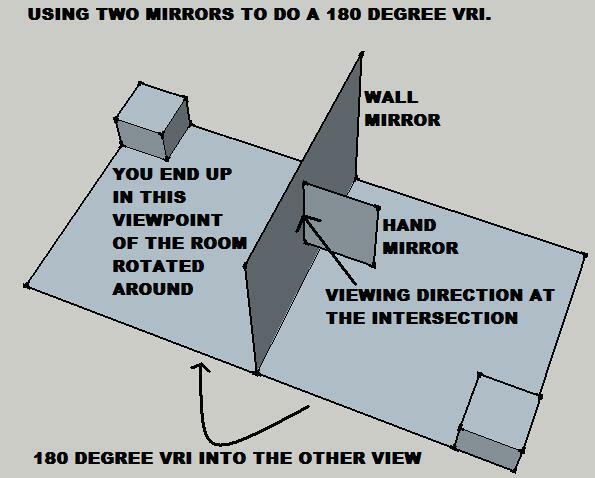 I have attached a sketch I made to illustrate how to use two mirrors to assist in visualizing a VRI. What is neat about it is that one can use the mirrors to see into a 180 degree rotated around viewpoint of the room that you are in. Please be careful with the mirrors, I wouldn't want anyone to get hurt with them. Incidentally, this is how others see you, and how you look in pictures. In behind your reflection, you'll see the room that you are in, but it will be rotated around 180 degrees. It will look as if the room you are in has been picked up and turned around in the opposite direction. Keep in mind that because it is a double reflection, all writing appears normally, as it does in the room you are in. All you have to do now, is stare at the double reflection and your face, and do a VRI flip so that you exchange positions with your reflection! What will happen is that you will end up looking at yourself from the opposite direction, and will have experienced a 180 degree VRI. You'll be in the rotated around viewpoint room. Have fun with it and try to hold the new viewpoint as long as you can. It's like experiencing a whole new dimension of your world. Normally, after a VRI, one's brain automatically flips one's viewpoint back to the normal position, so you will flip back to the "other side" of the mirror again, but try to flip back and forth between the two viewpoints. I find it a lot of fun to do this. Let me know if you can do a VRI this way. I've had this pretty much all my life. I have no memory of it not being there. I never experienced a disorientation or "lost" feeling, but the 90 degree "shift" is as normal to me as breathing. I can do it at will; sometimes it's just there, and I can usually re-orient as fast as I need to (very important when driving or walking in unfamiliar circumstances). I may have tried to explain it to people, but realized early in my life that there were no words for it. I kind of assumed that everyone had this phenomenon, and like me, just didn't bother to mention it. For most of my life, I could do three views, but in the last several years, it's just been two. I'm 64, and this is the first time I ever looked it up or researched it at all. It's one of those things to which I've always said: " I wonder what THAT is?" Rarely has it been an issue that I thought needed attention. I think my acceptance of it stems from it having been there as long as I can remember. I'm pretty sure, though, that I used the spin method when I was a kid.Nobody thought twice about a 5-year-old spinning around anywhere. The internet was years in the future, and kids had to do something for entertainment. I guess I was an early adapter. The VRI involves more to do with an instant change in one's subjective orientational bearings, that likely involves head direction cells firing, rather than the slow process of reprocessing signals involved in perceptual adaptation. Also, VRIs can be made to happen at will with practice, and the change is seen instantly. Well I tried the mirror thing I do not think it worked. Earlier yesterday I tried spinning (before I read more in depth about the VRI) and it did not work. Last night, I was reading and then suddenly I felt like I spun just a bit, like an instant dizzyness, and then something odd happened. I usually have this "forward" feeling of where my door is, which is how I wake up every day, but I felt as if forward was toward another wall (90˚). Not sure if this was a VRI, because when I just turned my head everything was normal, and there really never was any flip. This may have been my imagination because after the slight dizzy feeling It was just like the world turned again. I got out of bed to "explore" everything but it was all normal, and there was really no "flip" back. I felt this feeling a bit later but it turns out there was no real "direction" change feeling. I think it was simply a matter of being tired. The only other person I know who has experienced VRIs has the best sense of direction I have ever known. Usually happens in the theater, and I have been trying to get as much information out of them as I can to try to replicate the experience. The only other near VRI experience I think I had was when I did the mirror trick, which I do not think worked. I stared at that, tried to imagine myself looking out of the mirror. I tried it with my eyes closed and open. After like 10 minutes I gave up, but instead of backing up I actually moved forward toward the mirror toward the reflection of my bed, which was actually where I aimed at going regularly. I felt proud because I thought I had a VRI but when I put the mirrors down it was all the same. I do not know if it was simply a matter of foggy mirrors/too small but I still did not really feel any "flip"
I kind of know what you mean by this flip you speak about, but it is just weird for me. I do not know if you should close your eyes for this or not, if you should focus in a quiet room or just do it anywhere. I am still interested in this but I apparently have not experienced it yet.